Known to the blogging world as WhyMommy, Susan Niebur is an astrophysicist, a mother to two young boys, an advocate for cancer education and research, and a survivor. Since 2007, she’s graciously, frankly and bravely let us into her life through her blog, Toddler Planet. She’s let her readers walk with her as she’s battled Inflammatory Breast Cancer and dealt with its physical and emotional fallout, all the while advocating for women in planetary science. She’s had a recurrence, and is slated to have surgery today. 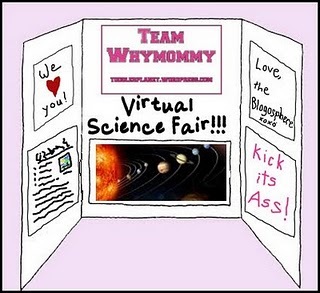 So, to let her know that we’re all thinking about her – thinking of the whole of who she is, not just this tenacious disease she keeps kicking — Stimeyland is holding a virtual science fair. People have been making an effort to do something science related (with kids or on their own) and posting about it today in Susan’s honor. If you read Tiny Mantras at all regularly, you might guess that I don’t go through a day without doing something science-related. And you’d be right. So far this week, I’ve overseen the assembly of an anatomy floor puzzle and helped my son navigate CERNland — a kids’ site designed to explain particle physics and illuminate what the Large Hadron Collider is doing. We’ve snapped together models of the Ares Launch Vehicles that NASA is developing to take people back to the moon, and eventually to Mars. We’ve read Millions to Measure. I gave birth to the whole universe — This is the way we tell a bedtime story. Beginnings of a solar system magnum opus – This is the way we write a song. Sometimes, science makes us anxious. It makes us dream. We sleep in the rings of Saturn. Every placemat, book and ball in our house has been part of the solar system at one point or another. Space changed the way I look at art. Halloween costumes — My son has actually been getting smaller every year. First he was space, then the solar system and last year he was Jupiter. I once had to convince my son he was on Triton (Neptune’s moon) to get him to take a bath. There is really nothing cuter than a 2-year-old talking about space or going through Hubble Space Telescope images or interpreting the world through space or warning you about impending doom. Spaced out at NASA’s Plum Brook Station — This is a huge NASA site in Ohio that’s rarely open to the public, but they had an open house in 2008 and we went. We also like hanging out in Space Shuttle tires in Wapakoneta. Here are some kids’ space books we love. Here is one Carnival of Space. And another. Be well, Susan. Kick this cancer to the Kuiper Belt. We just went to the Neil Armstrong museum in Wapakoneta when we visited my in-laws over Christmas! This is fantastic! I absolutely adore the Jupiter Halloween costume! Great job! And I might just have to take my kids to that CERNland site. I think they would find it fascinating! Thanks so much for taking part in the science fair!